November has been a busy month for me. 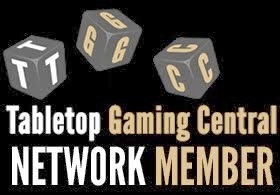 A lot is going on in life and so I am spending less time than I would like on the hobby. 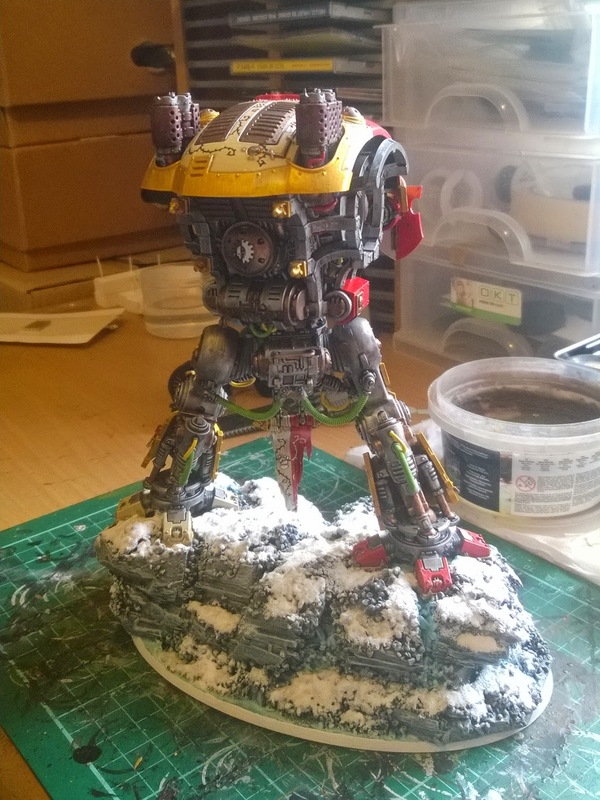 Luckily on one of the forums the tale of painters is helping me crack on and keep up with what I have to do. First up this month is Azrael. 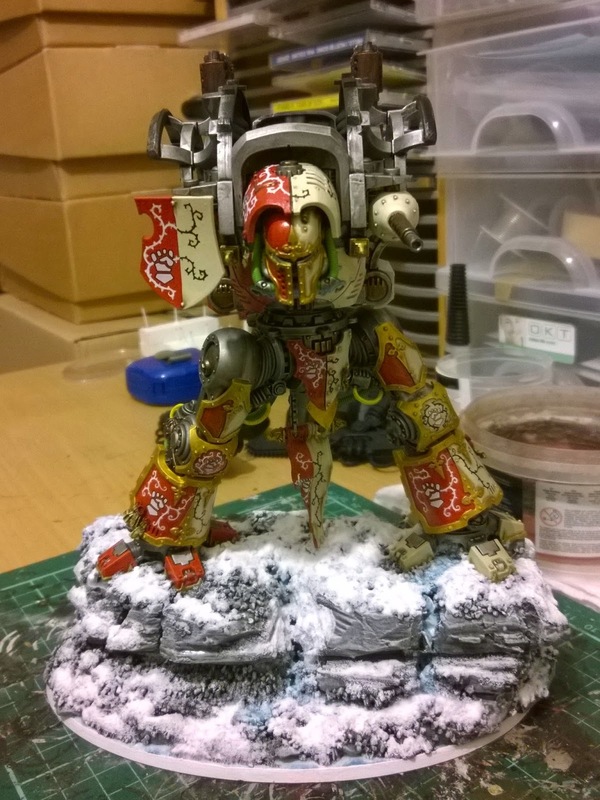 As usual he follows the colours for my army. 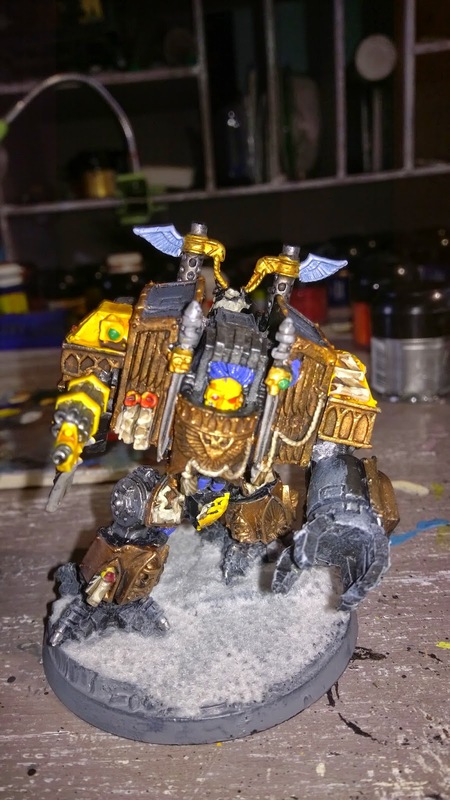 Being in the Chapter Council he wears deep gold armour rather than the black. This should make him stand out a little more from the normal guys. I was going to try and put him and the helmet bearer on a single base. However when I was positioning them they didn’t look right together on a 40mm base. I didn’t have any other size bases to try out so stuck with the standard 25mm base. 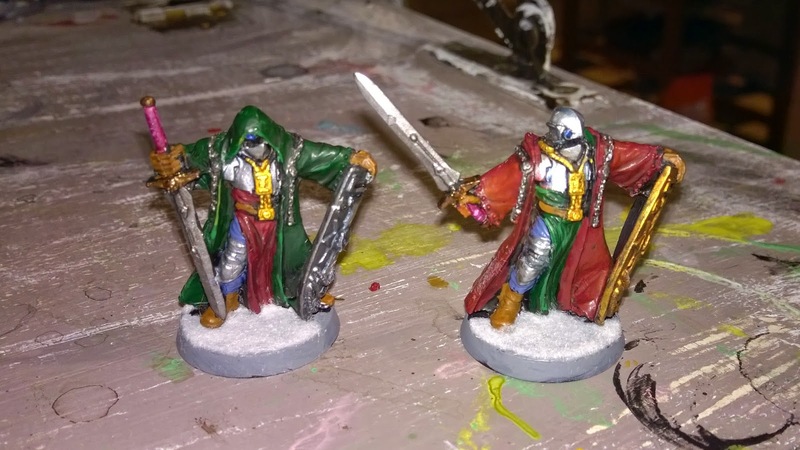 Next up I have 2 Crusaders for my Inquisitors. I used alternate colour schemes for them, while keeping the same pallet of colours. 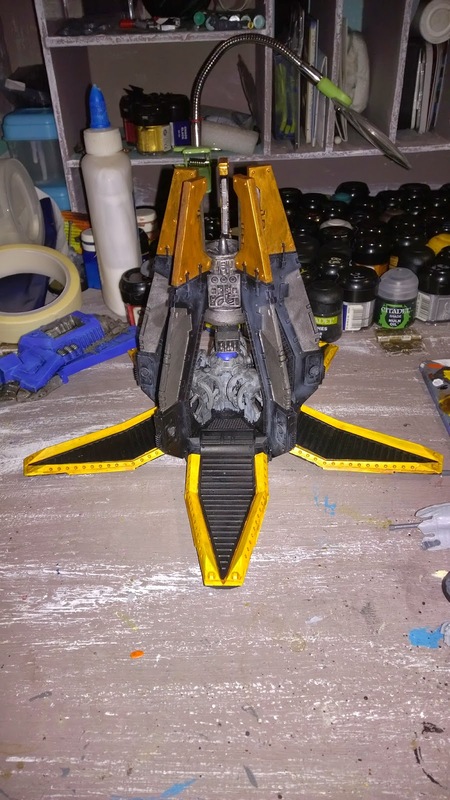 Finally I have finished my 2nd Drop Pod. I have a further 5 of them to do and may need a few more to bring them up to company strength. Now that November’s tasks have been completed I can now focus on the BLOG task for December, FORGEMAS. 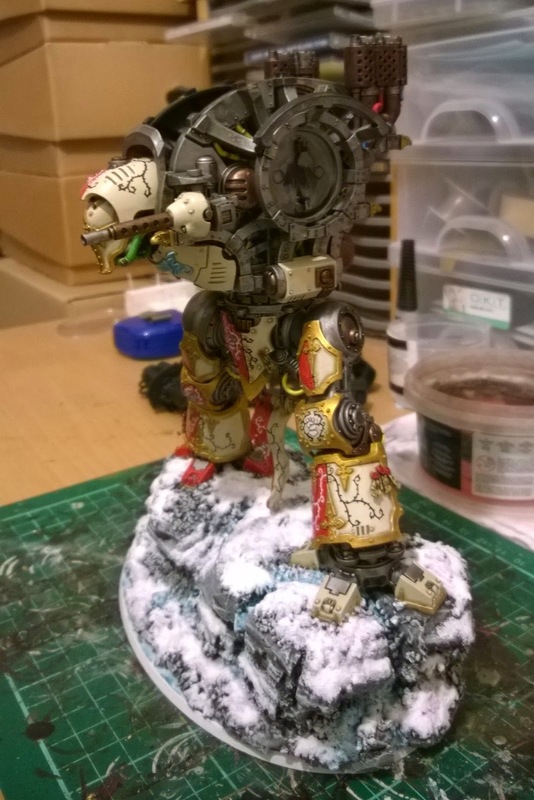 Bray and Contemptor were out as I have just painted a dread and we did dreads last year. The Horus characters I do not feel confident enough to do a good job on these guys yet. In preparation I have already cleaned and washed all the resin parts. Come the 1st I will assemble and start the process of painting these up. 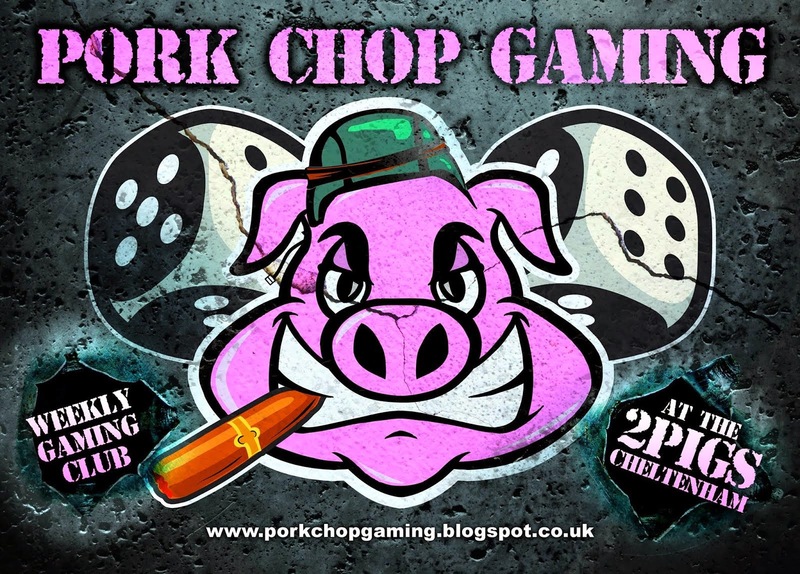 regular updates ahoy! 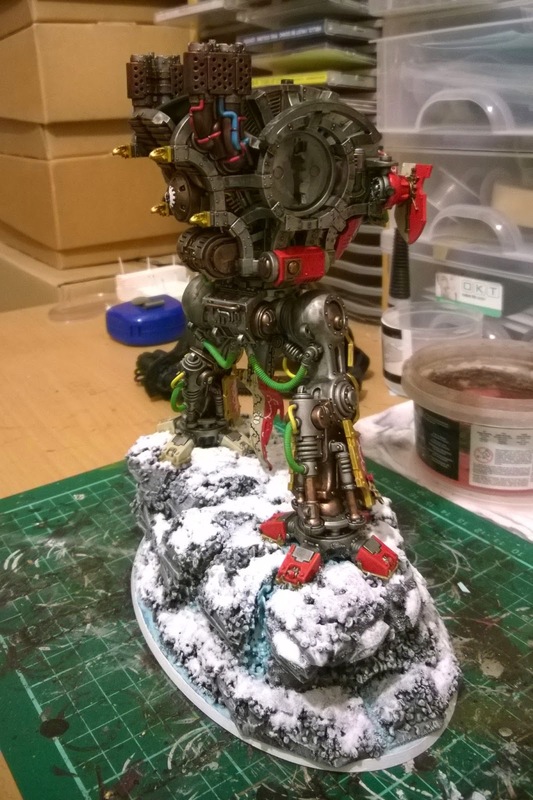 Bluddtoof here with an update on progress so far on my 1st Imperial Knight Freeblade. 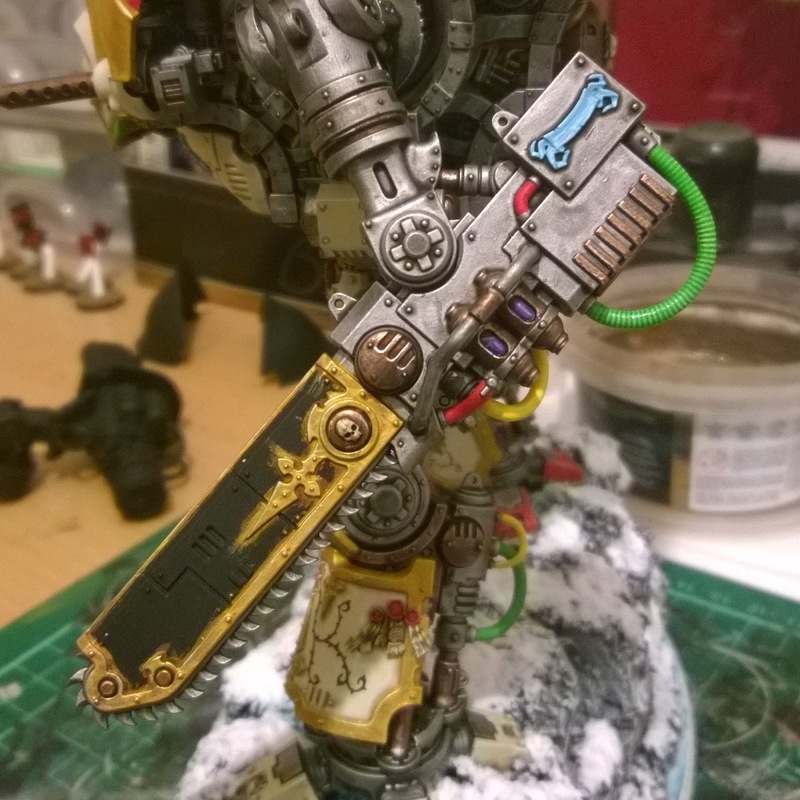 I've got most of the left arm done now, the Reaper Chainsword, just the 2 coloured panels to go. I've got the hang of the cream and the red now and I can finish it much quicker. 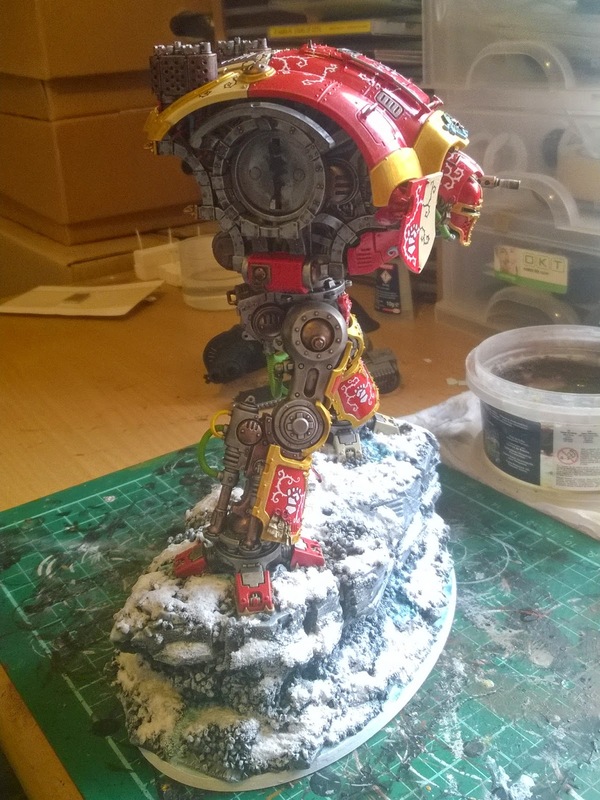 Hopefully this model will be done in 2 weeks time so I can crack on with my Forgemas entry, for details of Forgemas; our December painting event see here. DOC here to announce this years December event. 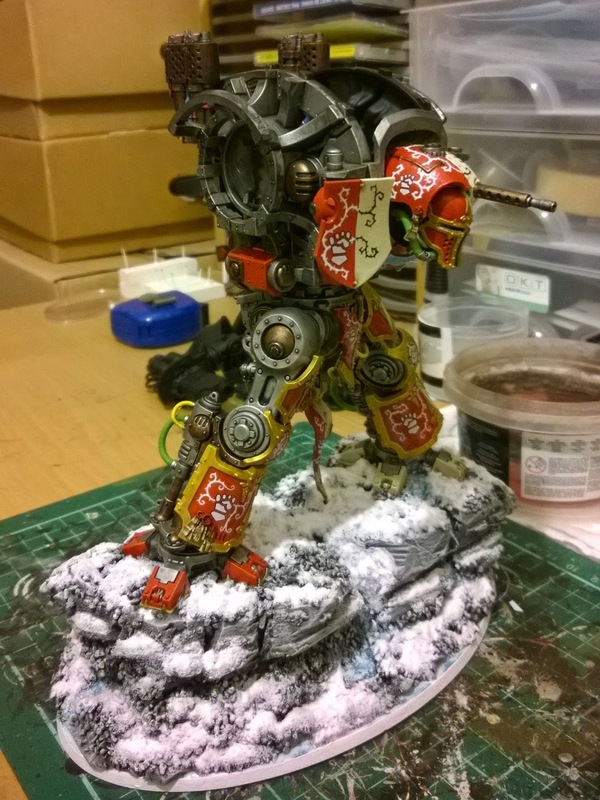 Last year we had Dreadfull December a month of us painting up Dreadnoughts. Look up the Dreadfull December label if you want to see what we got up to last year. 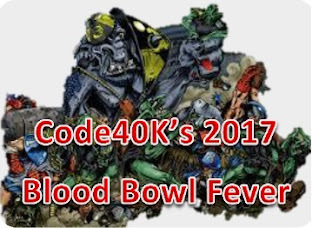 Basically CODE40k members have agreed to paint up Forgeworld models and showcase them on here. 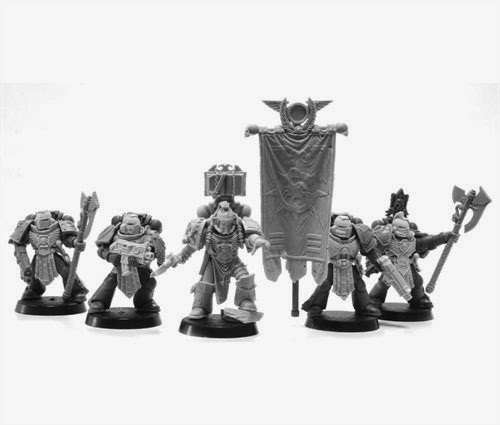 The rules of the game are simple any single forgeworld model from a single character up to lords of war. At the end of December we will have a vote to see which model is best in the opinion of blogosphere. 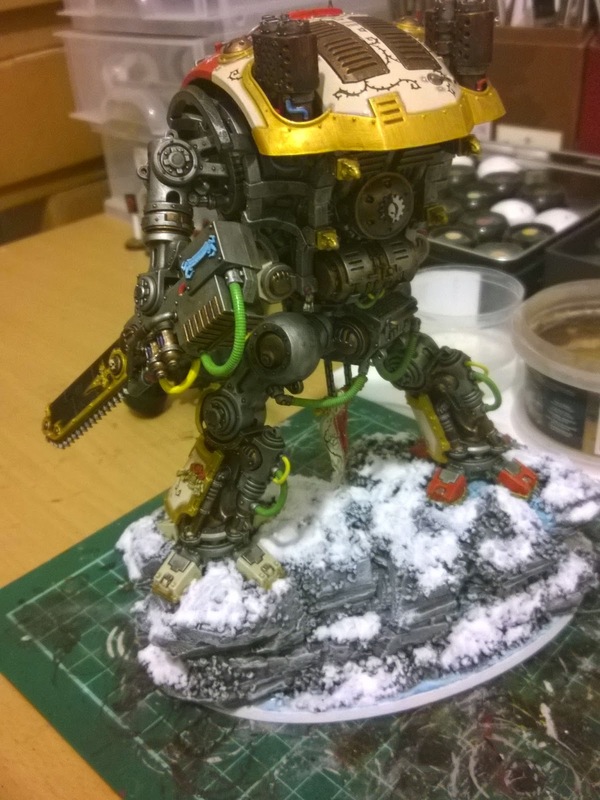 But thats not all....This year our local games store Worcester Wargames have also joined in on the action. 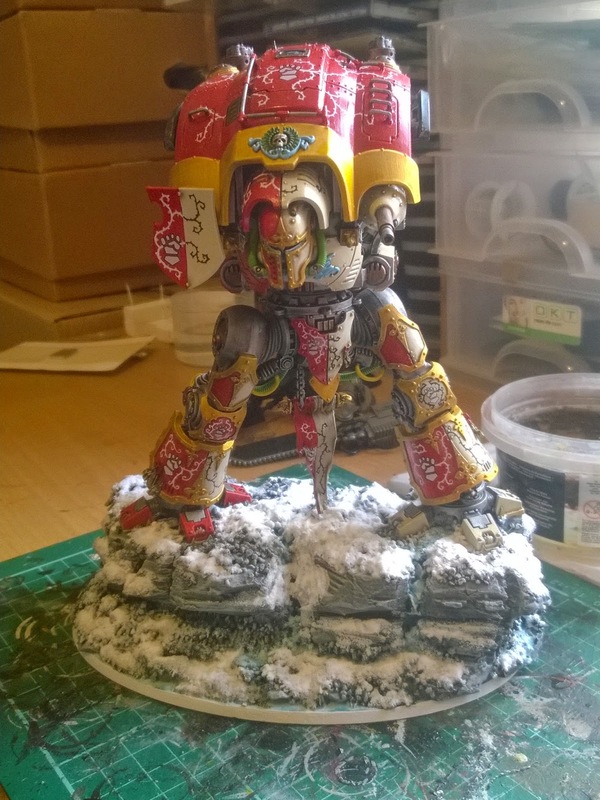 On the 27th December we invite painters local to Worcester to bring down there painted forgeworld model to compete for the forgemas title. We will be asking everyone to vote for their favourite model. 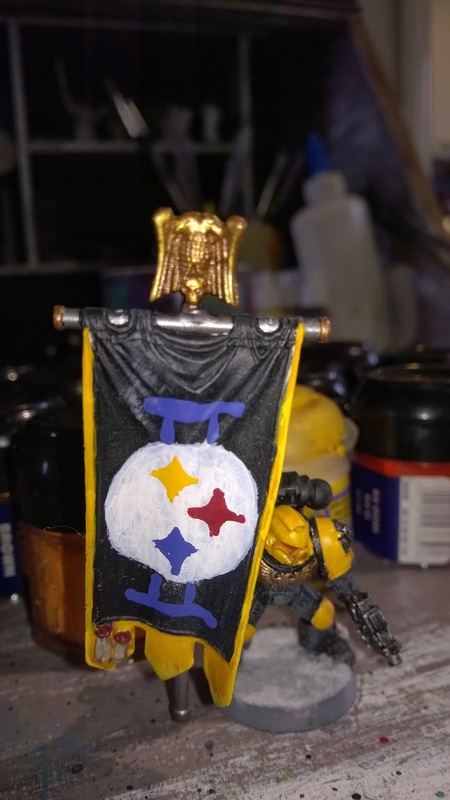 We will run two categories amateur and pro meaning painters of all abilities can enter. Voting will kick off at midday. 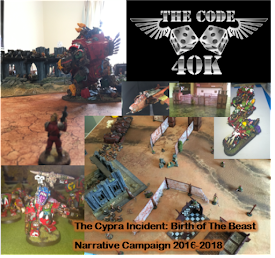 As always with these events its just another tool to help us all paint them models we spend so much of our hard earned cash on. 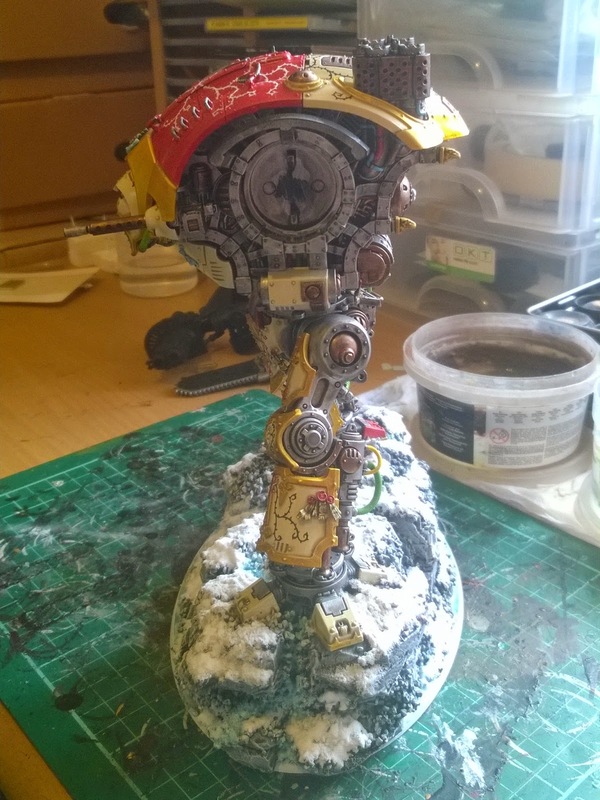 Imperial Knight Freeblade, W.I.P, carapace on. 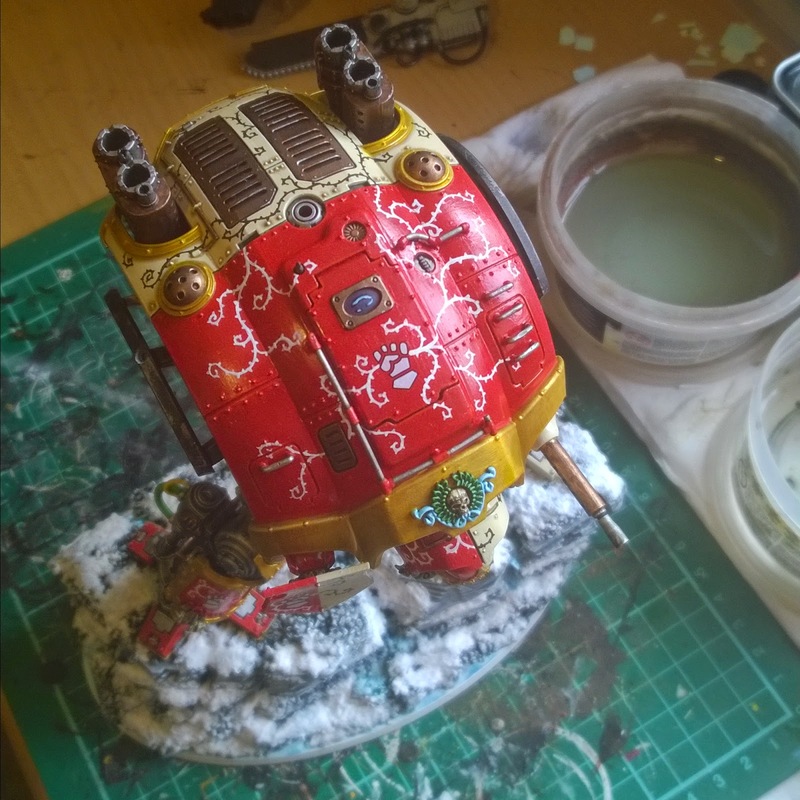 Bluddtoof here with an update on the WIP of my Imperial Knight Freeblade. As you can see I've now completed the upper carapace with lots of lovely thorny vines. 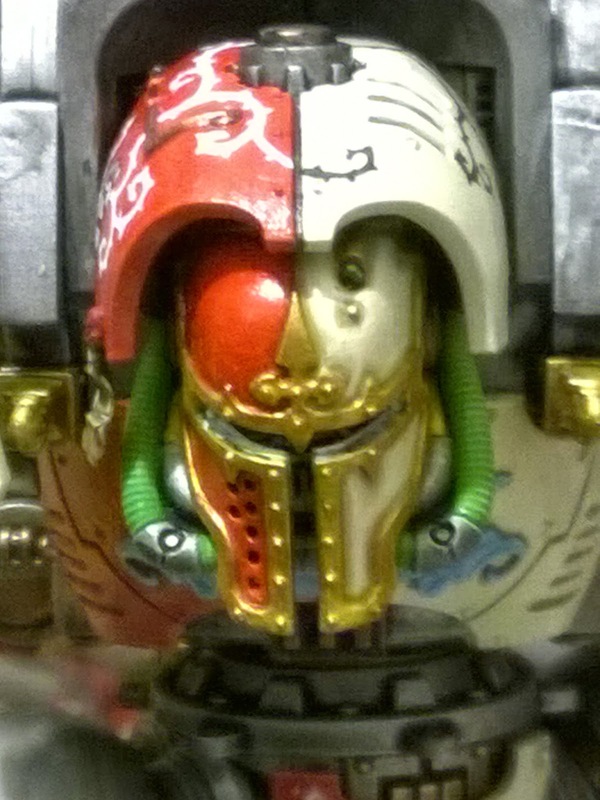 I'm now working on the arms and attempting to magnetise the shoulder pads so I can keep the arms removable. 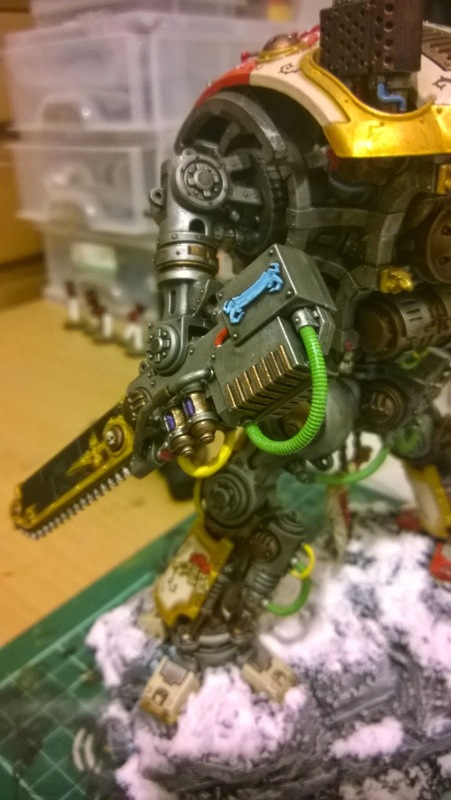 Tricky tho as the magnets I have are a bit large, I'll be sourcing some smaller ones. I am back from my holidays and I am feeling refreshed and ready for more painting. 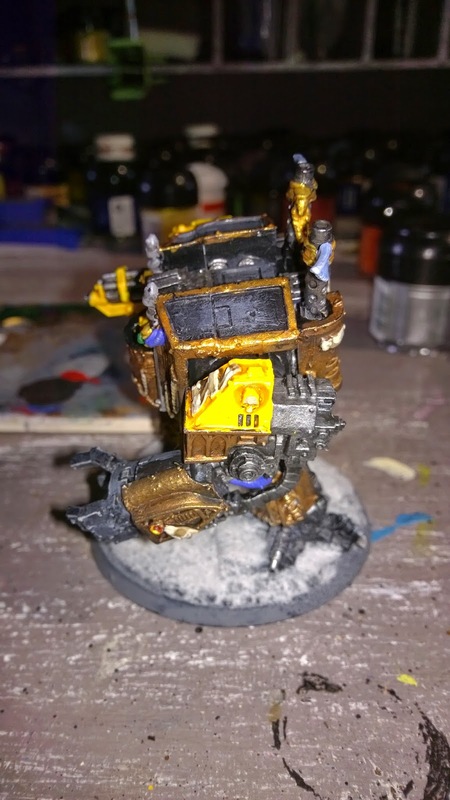 First up is a Venerable dreadnought I have been painting. It is the older metal one, which I like more than the current plastic kit. 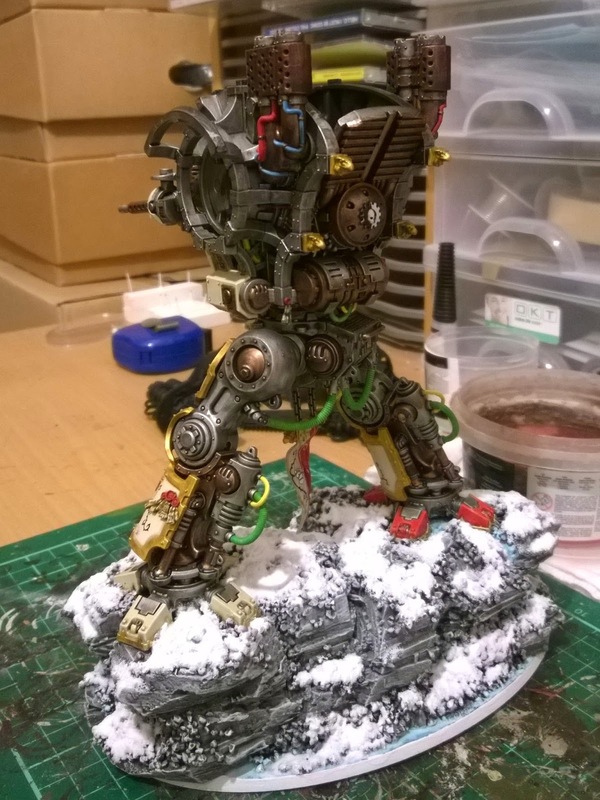 I had been looking around for the model for a while and seen a few on eBay for silly prices (£40+). I spotted this one and I got it for £18. It was missing a finger, but a bit of green-stuff and I don’t think you can notice the difference. 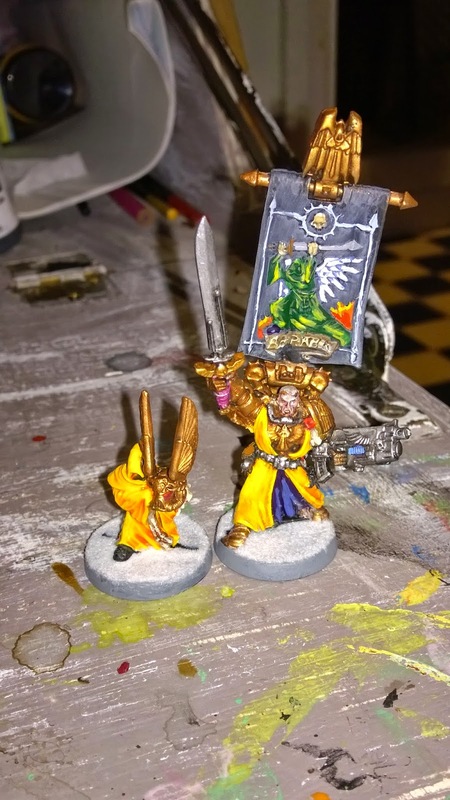 It has been painted in a similar scheme to that of my Masters of the Chapter and other high ranking officials of the chapter. 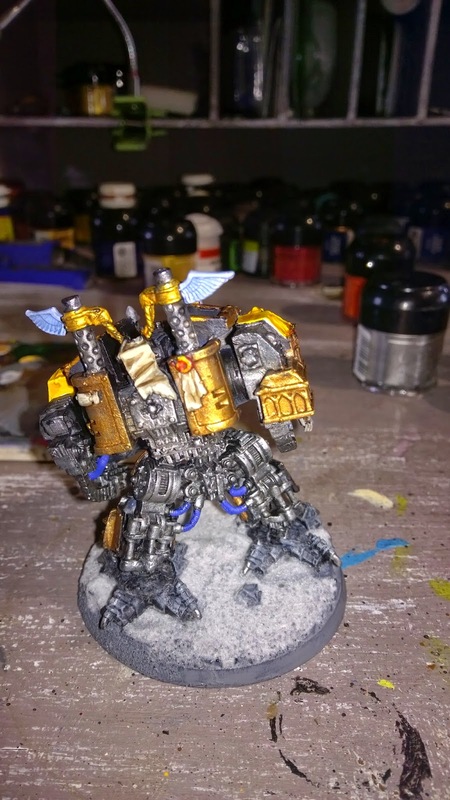 A nice deep dark gold for the armour makes the model look a little more important! 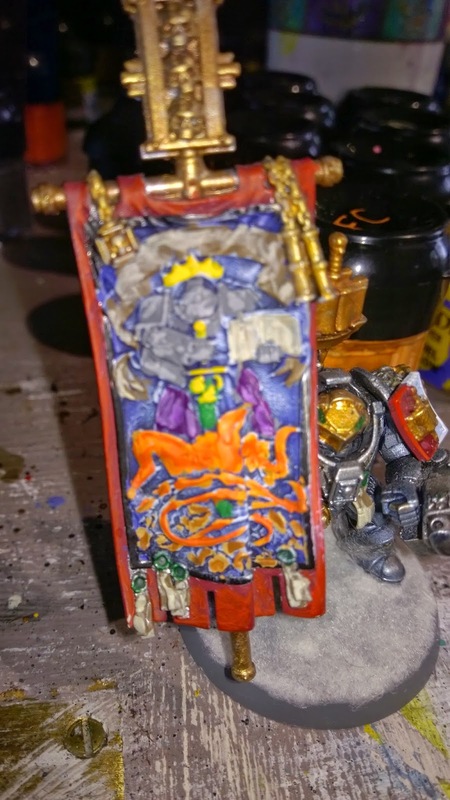 I also added some more details to one of my grey knight banners. As well as adding some symbols to a company standard. 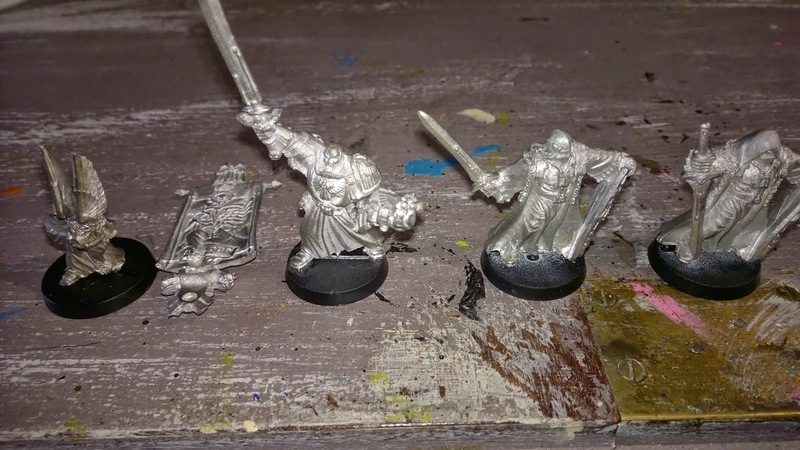 Next up is Azrael and 2 crusader henchmen. 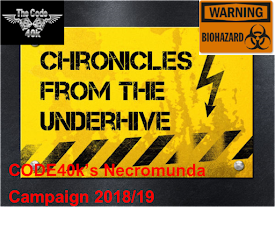 And finally the code guy are planning special event for December, I will let MAD-DOK explain later but it will involve lots of nice models……. 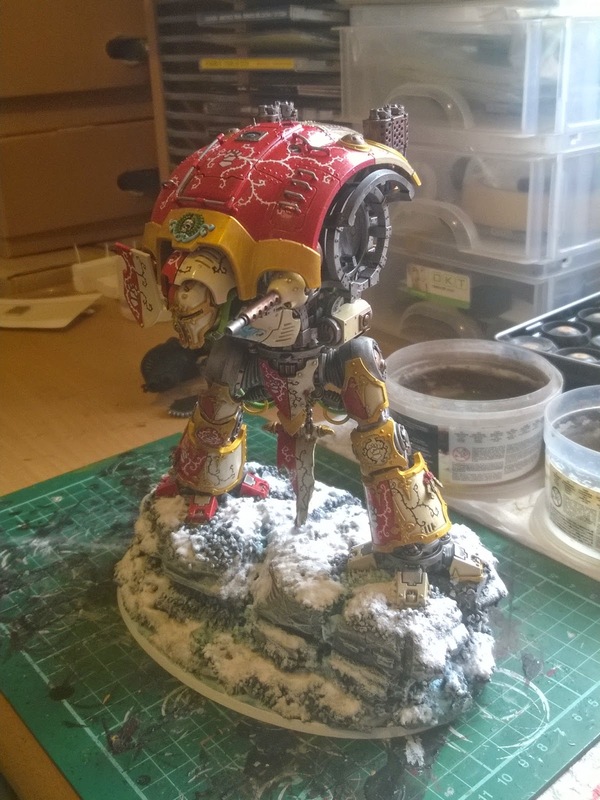 Imperial Knight WIP, torso done and in place. 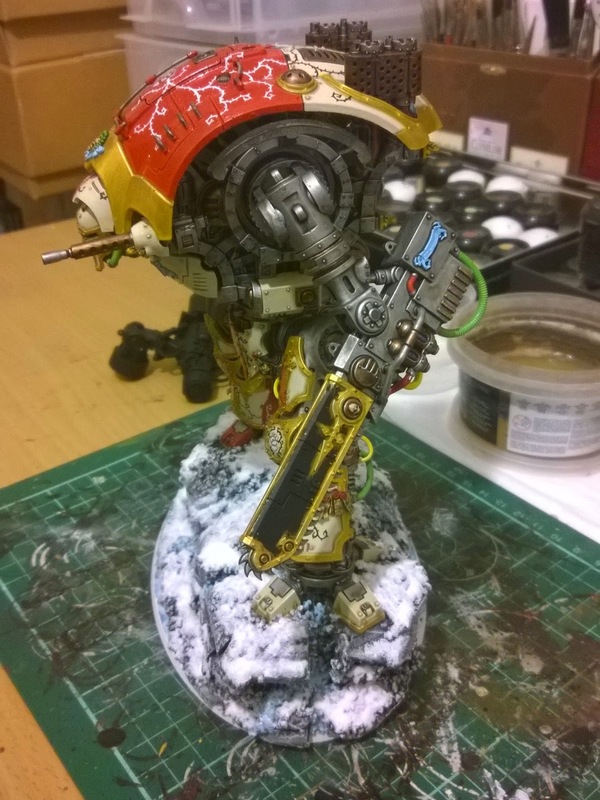 I've finished the torso of the Knight and it's now fixed in place, after a little dry run to get the positioning right. 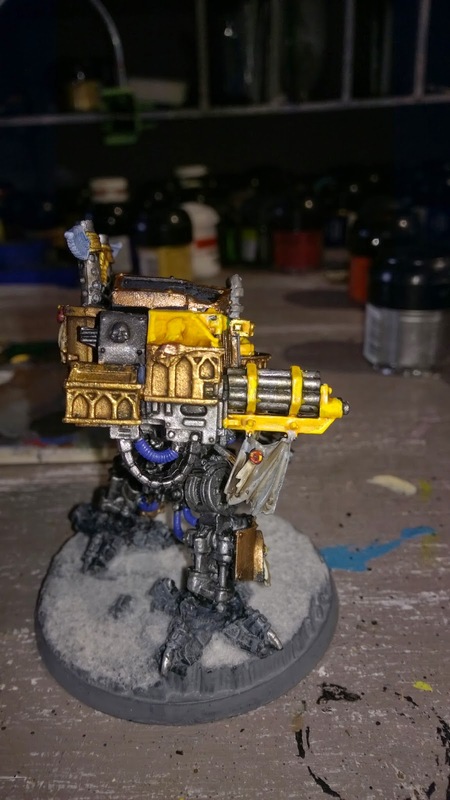 Whilst doing the dry run with arms and shoulder pads in place I discovered that the arms cannot be removed if the shoulder pads are fixed in place as the overhang at front and back stops the arm assembly from fully rotating. So, once I get to the arms I'm going to have to decide if pinning the pads in place onto the shoulder frame will work, as that's the only way I'll be able to have removable arms. 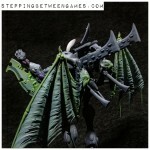 I like the idea of removable arms for purposes of packing and moving and also to represent weapon destroyed results.